Ford unveiled the 2018 Mustang during the Detroit auto show. It gains a more aggressive look that includes new hood vents and an optional spoiler. Ford says the freshened 2018 Mustang will be its fastest pony car ever, going from zero to 100 km/h in fewer than four seconds with its new optional "drag strip" mode. The vehicle, which goes on sale this fall, will also gain horsepower and torque over the outgoing model, thanks in part to the automaker's new 10-speed transmission. Horsepower for the 5.0-litre V-8 engine jumps to 460 from 435, and torque increases to 420 pounds-feet from 400. The four-cylinder, 2.3-litre EcoBoost engine gets 310 hp -- same as the 2017 model -- but the torque increases 30 pounds-feet to 350. The zero-to-100 time (zero-to-60 mph) for the V-8 engine bests that of the $117,000 (US $94,000) Porsche 911 Carrera, Ford says. It's achievable with the automaker's new "drag strip" mode, which comes as part of an optional performance package. 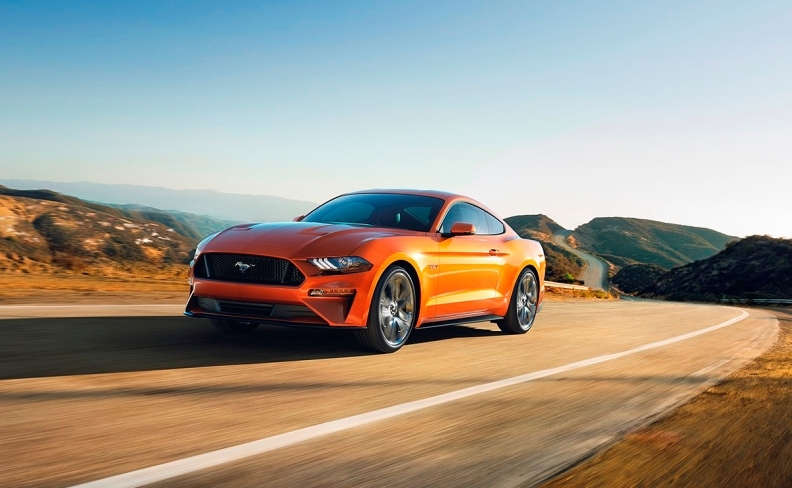 The four-cylinder EcoBoost engine in "drag strip" mode goes from zero to 100 km/h in fewer than five seconds. Ford is dropping the Mustang's 3.7-litre V-6 engine, which executives have said account for 15 percent of sales.